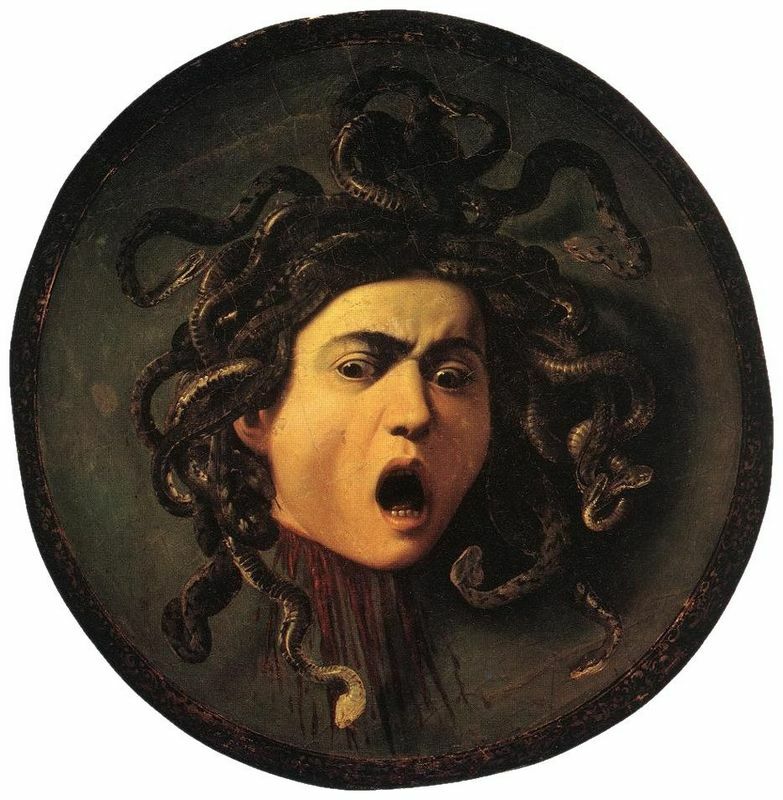 Variously described as a "pernicious poison," the "anti-Christ of art," and the cause of the "decline and total ruin" of painting, Michelangelo Merisi da Caravaggio was born in an age as dark and sordid as his personal life would come to be. Contemporary Italian society was one of almost schizophrenic contrasts. The still-Gothic city of Milan (just west of the small town of Caravaggio, where the artist was born and raised) was a Spanish territory ruled by Philip II. A rich banking and merchant industry continued to flourish here and the lucky members of the aristocracy lived in the most lavish of comfort. At the same time, however, the city was home to a rapidly growing population of the illiterate poor, drifting out of the country side and into the city due to severe hunger and disease. Michelangelo was the first of the three children born to his father, Fermo Merisi, and mother Lucia Aratori, who married in the same year as Caravaggio's birth, 1571. Although no records exist to clarify the exact date of birth, Caravaggio was probably born on the 29th of September, the feast day of the archangel Saint Michael. The Merisis were fortunate enough to lead a relatively comfortable, middle-class life: Fermo was the ambiguous major domo/architect/mason for the enormously powerful Sforza family of Milan and Lucia had some familial ties to nobility as well as some properties of her own. The Sforza family apparently held the Merisis in high esteem, Francesco Sforza even acting as a witness for their wedding. 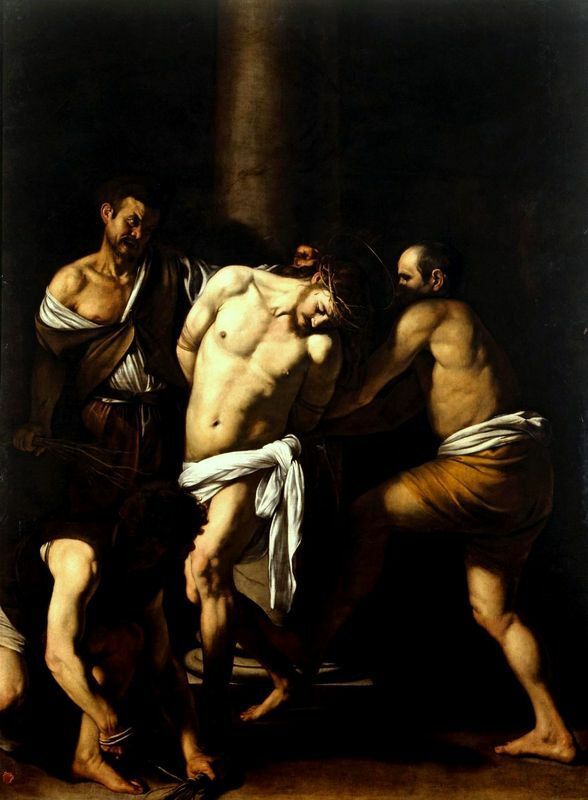 Although his family was fairly well-off, as a boy Caravaggio would have witnessed intense pain and suffering all around. He was born in the midst of wretched poverty and famine, as described by contemporary diarist Giovan Ambrogio Popolano: "in the year 1570 there was a great famine, with no food to be found... after the famine the death rate soared, and more died among those who did not have food than among those who did, and suffered hunger, and this was the year 1571." 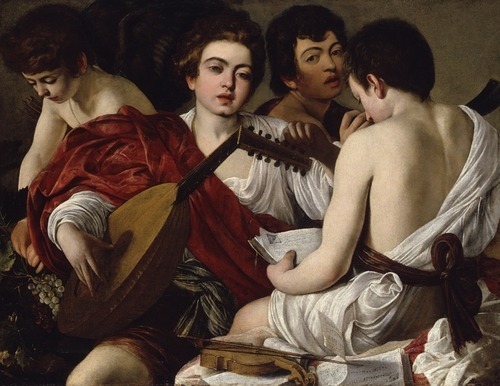 Young Caravaggio would also have been raised in an atmosphere of the most intense religiosity. The return of Cardinal Borromeo to his hometown in 1565 after serving in Rome and helping to lead the Council of Trent meant that religious fervor in Milan reached its zealous peak during the last decades of the sixteenth century. Just as the Cardinal arrived, Milan and its surroundings were in the throes of the terrible plague of 1567. Because of the resulting quarantine, citizens could not leave their houses to go to church and so Borromeo led the faithful in worship from their doorways and windows, organizing dramatic, ceaseless displays of penitence and prayer. The plague is described by contemporaries in horrific, bone-chilling terms: "As people walked outside, those within screamed, and beat against the windows, lamenting their calamities. " Caravaggio's own father and grandfather were to succumb to the disease on the 20th of October, 1577, when the boy was only about 6 years old. After the death of his father, Caravaggio's mother moved her family back to the small town from where the artist got his name. 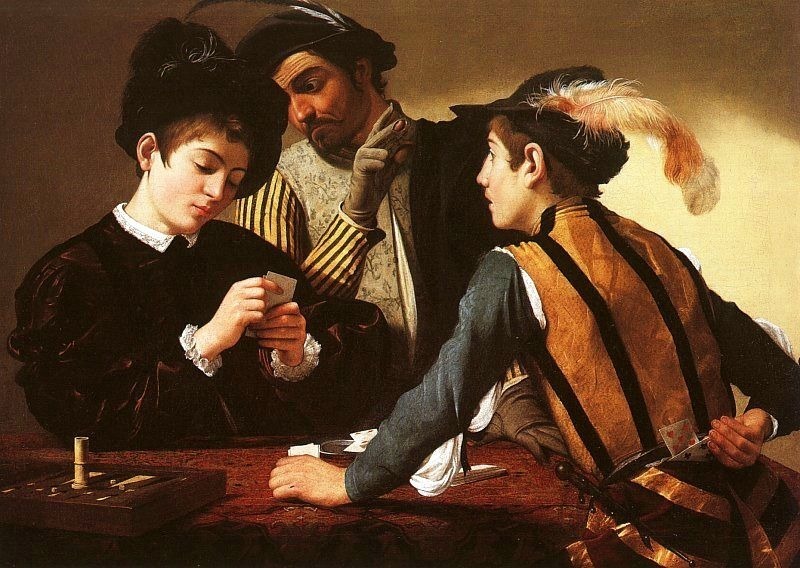 In 1584, at the age of 13, Caravaggio was apprenticed to the mediocre local artist Peterzano. Caravaggio stayed in Peterzano's workshop for four years, learning the basics of the artist's craft. The years 1588 to 1592 in Caravaggio's life remain obscure, although one biographer suggests that the artist visited Venice during that time. Whatever the case, by 1592 the impetuous 21-year-old artist decided to pack his bags and move to Rome without any money in his pocket and without having completed a single notable commission that would help him gain work. 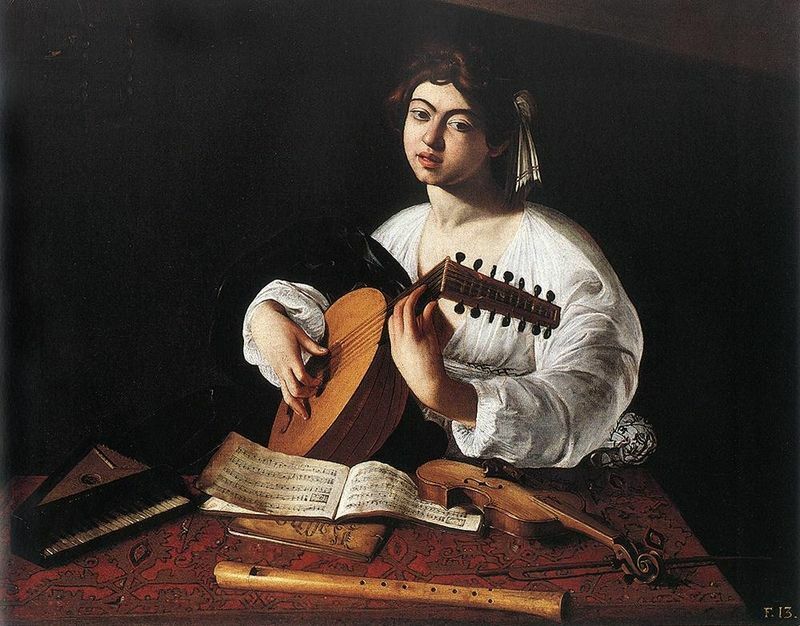 Although work abounded in bustling Counter-Reformation Rome, the last thing anyone needed was another poor and aspiring talent. Thanks to some strings pulled by Peterzano, Caravaggio managed to find a job as a workshop assistant to the relatively talentless but eminently successful Cavaliere d'Arpino (aka Giuseppe Caesare). This dashing artist was famous for his remarkable speed as well as his panache: the Cavaliere was known to paint in full dress, complete with lace cuffs and sword. He ran his workshop like an assembly-line, with Caravaggio in charge of executing all flowers and fruits. 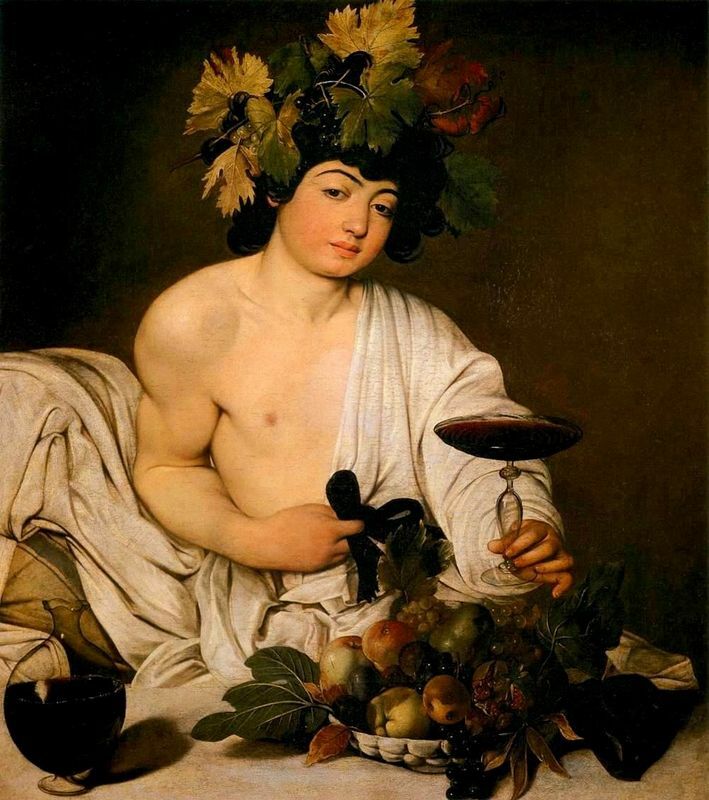 Tired of the tedious work and of being paid essentially in lettuce, Caravaggio left d'Arpino in 1594 and started painting small still-lifes, genre scenes, self-portraits and evocative pictures of young boys (like Bacchus) for the open market. In the same year he struck gold with his wildly popular The Cardsharps, which was copied numerous times and attracted the eye of the wealthy art enthusiast Cardinal del Monte, who acquired this as well as The Fortune Teller. Wild about his new discovery, del Monte invited Caravaggio into his court, which proved to be the artist's first major step to success. 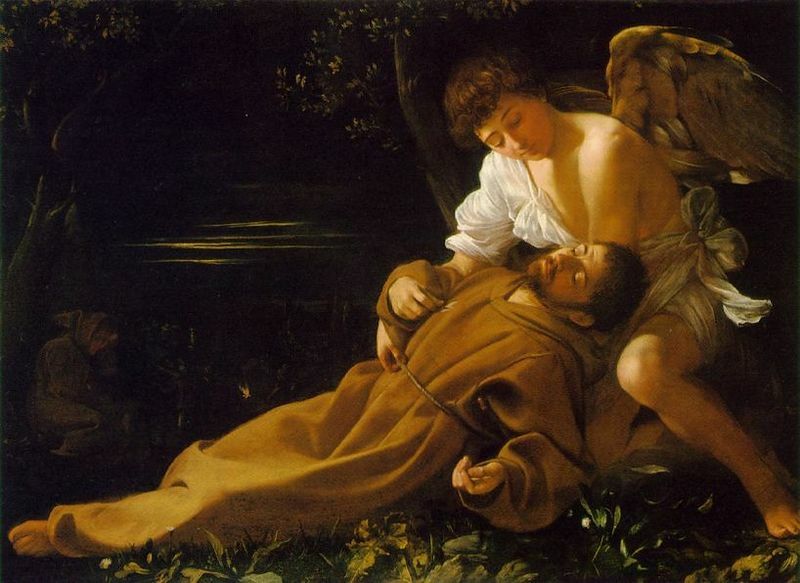 Cardinal del Monte not only commissioned works from Caravaggio (The Musicians, The Lute Player and The Stigmatization of St. Francis), but also used his influence to secure the young artist the important public commissions necessary to launch his career. 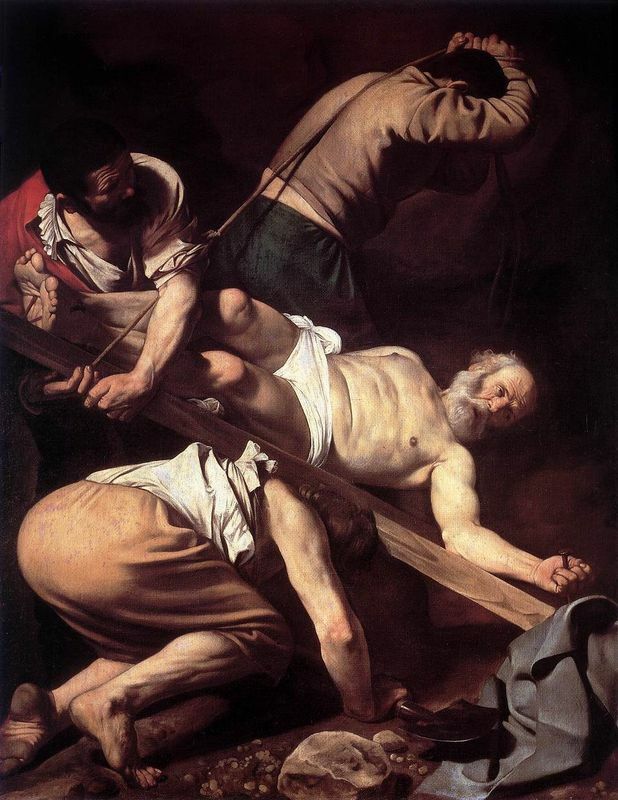 The first of these came in 1599, when Caravaggio was asked to complete a series of paintings depicting the life of Saint Matthew for the Contarelli Chapel in the church of San Luigi dei Francesi. 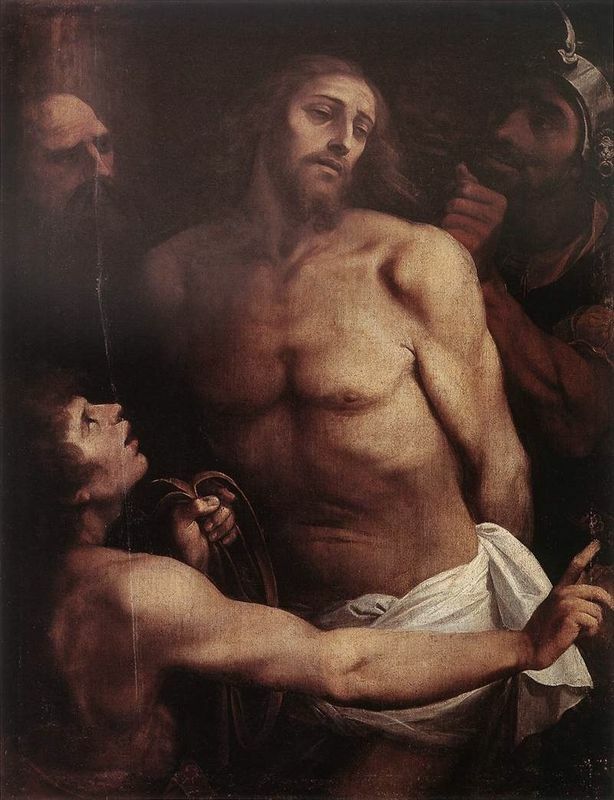 Caravaggio's paintings were wildly controversial for their stark, bordering-on-indecent naturalism, intense tenebrism and often morally questionable choice of models (Caravaggio caused a major scandal by using the corpse of a drowned prostitute as a model for his Death of the Virgin). However, they were also hugely successful, attracting admiring patrons (including the influential Cardinal Scipione Borghese, patron of fellow Baroque star Bernini) and young artists alike. Caravaggio was never able to capitalize on his success, however, for his character and personal life were even darker and more controversial than his paintings. With his unruly black curls and unkempt black beard, the artist was known to wander the streets of Rome dressed in black, accompanied by his black dog, Crow (the bird-harbinger of death), and brandishing swords and daggers at the slightest provocation. He and his motley group of friends took as their motto nec spec, nec meto, or "without hope, without fear," and these were the words they lived by. Caravaggio had a police record many pages long filled with stories of assault, illegal weapons, harassing the police and complex affairs with prostitutes and courtesans. Caravaggio's numerous legal problems often meant that the artist would suddenly have to flee Rome or be otherwise unable to complete a commission. "he does not study his art constantly, so that after two weeks of work he will sally forth for two months together with his rapier at his side and his servant-boy after him, going from one tennis court to another, always ready to argue or fight, so that he is impossible to get along with". Caravaggio's brawling, trouble-making tendencies reached a whole new level on the 28th of May, 1606. 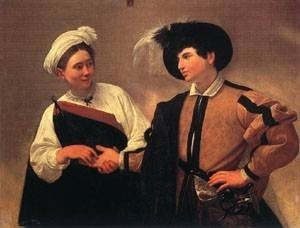 On this date, following a disputed tennis match, Caravaggio and his friends were involved in a street brawl with Caravaggio's young foe Ranuccio Tomassoni and his gang. Caravaggio ended up dealing the young Tomassoni a fatal stab wound in the groin. With a price on his head, Caravaggio was forced to flee Rome for the last time. The artist's last years were spent desperately running from one city to another, all the while trying to get a papal pardon to be able to return to Rome. After stopping by Naples, he travelled to Malta to try to gain the influence of the Grand Master of the Knights Hospitaller of St. John, Alof de Wignacourt. The Knights were so pleased with the works the artist executed while on the island that he was accepted into the Order, only to get into trouble after yet another brawl. Caravaggio was imprisoned by the Knights in August 1608 and later expelled from the Order "as a foul and rotten member." The artist escaped once again and was back on the run. During this period, an unknown assailant attempted to murder Caravaggio during his sleep, only succeeding in disfiguring his face. Contemporaries described the artist as a madman during this time, exhibiting increasingly strange behavior such as sleeping fully clothed and armed and exploding into a violent rage at the slightest provocation. The artist desperately continued working, sending paintings to influential figures like Cardinal Borghese and Alof de Wignacourt in order to secure their influence to procure his pardon. Finally, in 1610, Pope Paul V began the process of granting Caravaggio's pardon and the artist boarded a boat to return home to Rome. He was never to return, however: Caravaggio died under unknown circumstances around the 18th of July, 1610, after only a decade-long career. His body was never recovered.